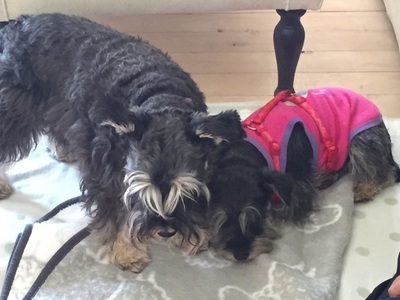 Saturday morning at our house in Ellisras, the first thing on my mind when I woke up was that today is the day that we meet all the available adult Schnauzies up for adoption, Yeh, I could not wait. The week leading up to this day, I have to be honest, I had lots of doubts if this was the right thing to do for me and my husband. We are the perfect people for the job, people often remark that our house is more a 5 star doggie hotel than a house for humans. You have to negotiate your way around the many comfy doggie beds scattered through the house. For every comfy human chair or couch, there is a dog bed or carpet nearby. Dog toys take preference over walking space. 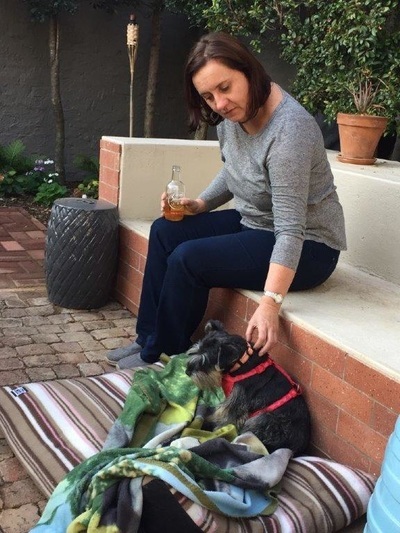 When guests arrive on our doorstep, they are made well aware of the fact that is house is owned by dogs and butlered by humans, they are greeted with the typical Schnauzer bark that usually continues for a minute or two, and our Scottie pup immediately go for the shoes. Who wants mom’s shoes in the closet to chew on if you can have moving shoes to chase full of smells from outside! Needless to say, I have not regretted taking Zoe home for one minute and cannot believe that we actually had doubts. I want to urge everyone that is reading this and are considering adopting an adult rescue to not let your fears take charge but to let your empathy and love comes to the fore, the Schnauzies so deserve our love. My heart is filled with gratitude for this opportunity to make a difference to a dog’s life, I often came across the saying: We do not rescue them, they rescue us, I only now, begin to understand what that means. Lofty (my Hubbie) and I noticed Hope St Elmien after ‘n while between the 24 adult Schnauzers that the Schnauzer Friends adoption team brought to Woodrock animal shelter for a meet and greet. She was easy to handle, Lofty noticed that if he holds her in his arms, she relaxes after a while, it’s almost like a sigh of relieve, you can feel the physical release of tension from her, until something startles her and she is on high alert again. She is much smaller than the other Schnauzers, with cute little stand up ears and the most amazing inquisitive eyes. The problem is, when you put her down, she skids off to behind the doghouses and you have to coax her out again. After about two hours spend with the doggies, we made our decision that she is the one and we tried not to get too attached since we needed to leave her at Woodrock for the night because we slept over at a guest house. Here is a photo of her (orange tag, in the middle) at adoption day, on soon to be my new Mommy’s lap and being held as if I was breakable. Estelle from Woodrock Animal rescue shelter came to greet us when we drove up to the gate. 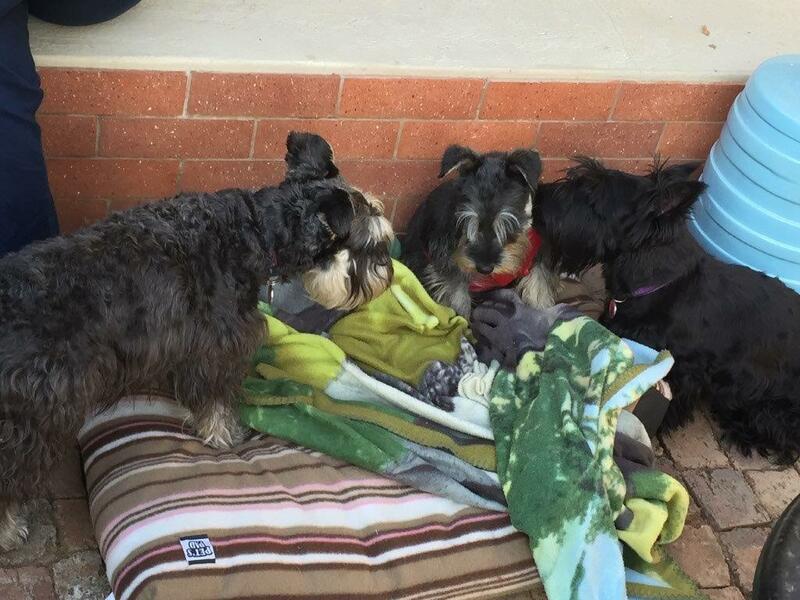 We had our two doggies with us, Jenny and Coco and was very nervous for all the dogs to meet for the first time. I realise now that this must be one of the greatest concerns all families with pets have, how will our doggies get along, will they pick on the unbalanced one, will there be dog fights, blood and tears flash before your minds eyes, I suppose its human to think like that. Again we were pleasantly surprised with what played off in front of us. The little princess just don’t stop to amaze us. The introduction went smoothly with all the dog’s tails high and sniffing each other’s you know what’s and then they went on sniffing the grounds. Estelle was amazing, she has a huge personality along with a huge big heart for the dogs. She is so knowledgeable and talks with such authority about rescue dogs that she made us feel like everything will be fine, it will be a walk in the park. She must have given us the most valuable advice about how to handle our rescue doggie, it’s actually so basic but we followed it to a T.
basically ignore the dog until there is trust. I thought to myself, OK, I can do that, hopefully after a few weeks we will be able to touch and pet her. I knew it would be difficult because she is soo beautiful and fragile, you just want to pick her up en comfort her, but we decided to give it a try. 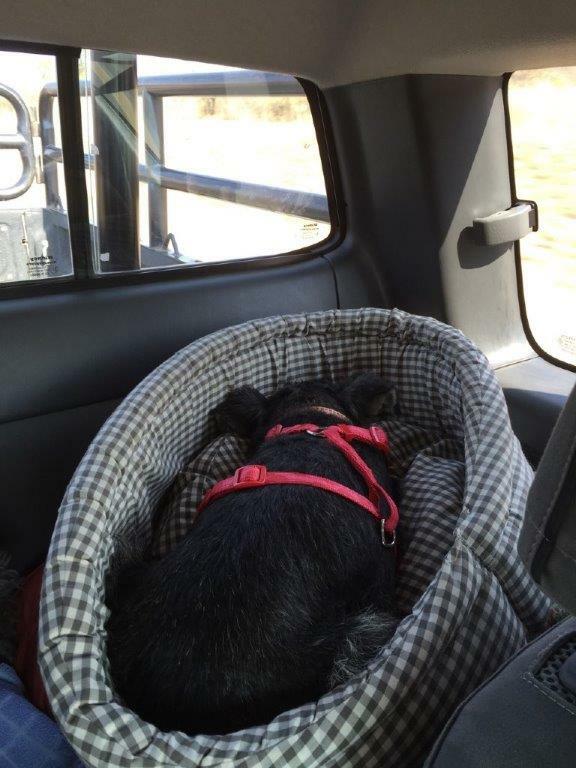 So our journey home began, we were so careful about talking softly and being very gentle with her in the car and when we stopped for a break, we had her very tightly on a leash, but, no eye contact. At that stage she was literally drawn into herself, when she sat down, she would sit like a bag of potatoes, just plumped down, she did not try to make herself comfortable, she would just sit as you put her down, bowing her head into her tummy, shivering slightly, she really did not want to see our eyes. We wanted to rename her and decided on Zoe. She needed a girly name and we think it suits her. We arrived home and I carried her into the house and put her down in the foyer. She stood very still and was very afraid at first, but also in a way curious and went after the dogs into the next room. We followed her and at some stage I noticed that she responds to me calling her like you would call a strange dog, a name does not register anything to her. That was the first huge breakthrough because we did not know how we will be getting her into the house if she decides to take cover in the garden. You just need to stand still, I Lofty moved, she would run away again. We decided to celebrate with a braai and she actually joined us and came to lie on the cushion that we brought out for her. Still the same head into tummy posture, but at least she was lying near me, I could not resist and gently stoked her over her head. She did not back away and I it almost felt as if she enjoyed it. A thought crossed my mind that it might be the first time ever that she sees fire??!! That night she slept in our bedroom in a soft dog bed, tucked in under a special girly blanket. The Zoe Princess Diaries - Continues 4. Monday 6 July 2015. Bonding with my dad Zoe’s first night with us went very smoothly, she slept in her dog bed until the next morning and went out for a wee when the other dogs started moving. That was one of my initial fears, that she would do her “business” in the house, the research suggests that’s one of the most difficult things to teach a puppy mill dog. That morning she met our housekeeper Onika and it was very obvious that it’s going to be a problem to let these two get along. At that stage Onika was her greatest fear and she was shaking like a leaf when she heard Onika moving around in the house. She would skid off until there is a big enough space between them and then stand and watch from a distance. We had to leave for a meeting out of town and retuned around 4 that afternoon. When we came back, she joined our dogs at the front door greeting us. That must be one of the most rewarding sights to see, wiggling her little body and wagging her tail furiously with joy to see us. We noticed that she seeks out the dog beds all over the house and finds them comforting. You can also approach her on the bed and she will stay still, just bows her head. She also warmed up to me and wagged her tail at me when I spoke to her. Still, we followed Estelle’s advice and would pet our dogs trying not to make a fuss about her. Later that afternoon I walked past where she was sitting on a dog bed and she actually looked up to me. I thought maybe it’s the right time to pet her, I stroked her head for a while and she looked relaxed. Lofty made a comment that she likes me and I suggested that he should also come and stoke her. She was still fairly scared of him. He started rubbing her tommy and she responded well. He sat down next to her and continued petting her. Our dogs joined in and that was the turning point in their relationship. I started making dinner and after 3 hours they were still there, the whole petting thing turned into a bonding session with all of them lying on the floor, so precious, Lofty didn’t want to move her, so he just stayed there on the cold floor with her. Dogs all over him (see the photo attached). The party later moved over to our bedroom, with her also on the bed. The next morning I took this photo of her on the big bed, tiny dog, the ice was broken, how amazing, only 2 days and she decided that we both are trustworthy, coming from a dog, I take that as a HUGE compliment. I will always cherish this first week we had with Zoe, so many rewarding moments. It’s amazing to see a dog go through the process of discovering things for the first time, to be part of this amazing journey of learning to trust humans, the very same humans that previously mistreated and abused her. You can always see the two sides of her, the true Zoe, trusting, loving and inquisitive and then the traumatized Zoe, shivering little soul that so desperately wants to get as far away as possible from the perceived danger. With time, only the true Zoe will be left. That, I strongly belief. There were many firsts for her. First time seeing herself in the mirror, first time using the doggie door which flaps close behind her when she jumps through it, first time to be on furniture and beds with humans, basically doing everything with humans hovering in the near distance. Then there are sounds that were a first for her, like the washing machine, cappuccino machine, the TV, the printer in the office, the gardener starting up the edge cutter, helicopter flying over the house. All the new smells in the house and the garden. So many different plants to sniff at. Oh and of cause the smell of different types of food! Food she never knew existed and continues to discover. So many senses overwhelmed. Imagine for a moment the first time we gave her biltong. We are so used to our dogs almost biting off a piece of your finger when taking it and then gulfing it down and immediately waiting or the next piece. Now with Zoe, It’s like this: the biltong does not have a strong smell and she was very reluctant to try it. You could see that she struggles with the texture of it, it’s quite different from the dry kibbles she had for the almost 5 years of her life. At first she only licked it a few times. Then she took it in her mouth, but bit on it with her front teeth, very carefully. The second piece was also first licked, then front teeth, then moved to the back teeth, by the third piece she started trusting the taste and was a fully converted South African biltong eating dog! 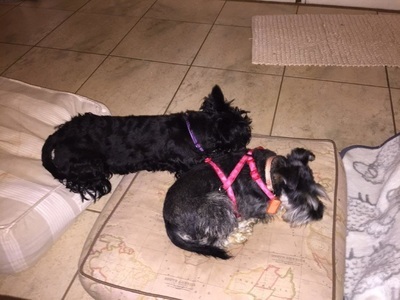 I was so surprized by her reaction to meat, as if she never had it before in her life, then it dawn on me, YES, she never had meat in her life, except for the liver bread that the Schnauzer friends dished out, which was familiar to her. Zoe started trusting me first, from the first day when I called her she would wag her tail, and came to me when I called her, and allowed me to touch her. She started trusting Lofty on the Tuesday after the Monday night that they spend 3 hours on the floor together (previous episode). On the 4th day she gave her first bark at our gardener Moffat and the barking just got louder and more intense at him. She also does not trust Onika our housekeeper and also barks at her and run away from her. She miraculously learnt from our dogs where the doggie ablutions are and has not messed in the house once. She started using the doggie door from day 2 by following our dogs, what a blessing. The first week was very difficult in terms of her drinking problem. She does not want to drink water in the house! Only from the swimming pool or from the water pond. One night, her barking outside woke me up and when I went outside to fetch her, so was livid with fear. I think she went out for a sip and could not find her way back to the doggie door. It took me about 5 minutes of patiently asking and waiting until she came in. She started taking food from us from around the 3rd day, but you cannot just walk up to her and present her with it, oh no, you first show it to her from a distance with lots of cooing. Only when the other dogs take some, will she consider taking it from your hand. I know it sounds like a small thing, but boy that’s a HUGE thing for a rescue dog to take food from your hand, it’s like a toddler giving her first step. The cameras come out and the whole thing must be recorded. She had her first bath over the weekend, Lofty held her and I washed. We did not use a sprayer but just poured water over her with a jug, she seemed fine with it. That weekend we spend a lot of time together and she was very relaxed because her two enemies Moffat and Onika did not come to the house for two full days, best weekend ever! 13 July 2015 - 15 August – Run Zoe, Run! It’s been a long time since I gave you guys an update, a lot has happened and also not nothing much in terms of progress. I suppose that’s how it works with puppy mill rescues. At first, there are many new things and then when the dog starts settling into her new role as pet, she adapts to the routine of the household and progress is slower. Nevertheless, we love her everyday more and more and she’s a real joy to us. We take our dogs to the school’s sports fields for exercise since we are not so fortunate to have parks. Nevertheless, they absolutely love it and I think apart from dinner, it’s their highlight of the week. When Zoe joined our family, I stayed behind with her at home and Lofty took the other two to the sports field the first two times. Then we decided that we will take a leap of faith and take her along. We were very, very nervous because at that stage she only barely started trusting me. We put her on a leash while the other two runs free. To get her into the car is a mission by itself since she does not like to be picked up and she sensed from the other two that something was up. When we arrived at the rugby field, we carefully put her down and as soon as her feet touched the ground, off she went until she felt the leash pulling her back. It took a while for her to get used to the pull of the leash, but at the end of the walk (or run) she was so relaxed and happy, that she did not mind the leash. The next time we went, we decided to let her run free after a while with the leash still attached so that we can sort of catch her if need be. I worked perfectly and we were amazed at how she follows us and come when we call the other two. Only difference is that she does not come right next to you, keeping a short distance. I have never seen her so happy before, it makes me so happy to see her like that, as if she does not have a care in the word. You just want to pick her up and give her kisses all over, of course that’s not possible, yet. When we went to the rugbyfield this morning, we did not even take the leash, she ran with the other two until their tongues dragged on the ground. I always say, a tired dog is a happy dog and our Zoe was truly happy this morning. I am so proud of her, when you see her run with the other two, you would never think that she is a traumatized recovering puppy mill rescue. Go Zoe Go! !